Two Irish citizens, three British passport holders and a Spaniard are confirmed dead after this morning's plane crash at Cork Airport. Four people were seriously injured in the crash, two remain in intensive care where they are being treated for chest, abdomen and spinal injuries. Two other people have soft tissue damage and are being treated for shock. 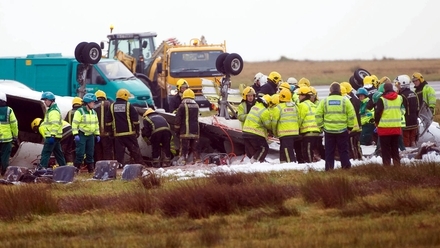 The Manx2 commuter flight from Belfast, flight number NM7100, had 10 passengers and two crew on board when it crashed. The 18-seater light turboprop aircraft overturned and caught fire while making a third attempt to land in heavy fog. 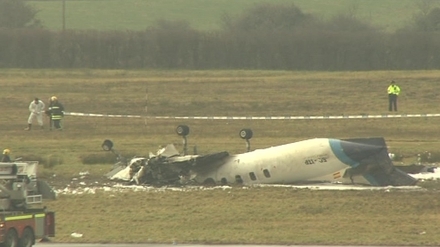 A witness at Cork Airport told RTÉ News that weather conditions were so poor that the crash could not be seen from the terminal building. One of the six people killed was Brendan McAleese, a businessman from Co Tyrone and first cousin of Dr Martin Mc Aleese - the husband of the President. He was the general manager of a company based in Cookstown. Another of the passengers who died was a partner from the Belfast office of international accountancy firm KPMG. Pat Cullinan was originally from Omagh in Co Tyrone. And in a statement tonight, the Belfast Harbour authorities confirmed that Belfast's Deputy Harbour Master Captain Michael Evans was among those killed in today's crash. Captain Evans joined Belfast Harbour in 2002 and was a well-known figure in Northern Ireland's commercial sector. The flight was scheduled to depart Belfast at 7.50am and eventually left at 8.12am. It was due to land in Cork at 9.10am. 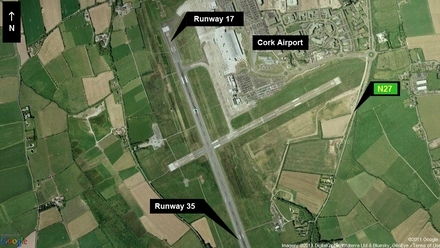 The plane first attempted to land from a southerly direction on Cork's main runway, known as Runway 17. This was aborted due to low visibility. It then tried to land on the opposite, northerly, approach to the main runway - known as Runway 35. The Aviation Authority says it is believed wind was not a problem, but the pilot was still unhappy with visibility. The plane went into a holding position for 20 minutes, before making a third attempt to land on the southerly approach to the main runway. At 9.42am, the plane was ten miles out from the airport. 10 minutes later, the plane hit the ground at what is called the 'western threshold' of the runway. Eye witnesses reported hearing a loud bang. It is understood the plane flipped over on landing and caught fire. 2205 Chairman of Manx2 Noel Hayes has confirmed that the crew on board the flight were a Spanish captain and an English first officer. They both died in the crash and had been working for the company for a number of months. He said the aircraft itself had no recent technical issues and had only come back from an in depth maintenance examination last week. 2200 Noel Hayes has said that today was the worst day of his aviation career and the worst day of his life. He said he was deeply shocked by what has happened and he sent his sincere condolences to all those families who have been affected. He said the company had ten years of experience with over 10,000 flights a year and he said it was a real tragedy for the company. He wished to thank all of those who have been involved in the incident at Cork Airport today and for their speedy response. He said his company was totally committed to finding out the cause of today's crash. He himself will be travelling to Cork tomorrow, a representative of the aircraft manucturer will be arriving in Ireland tomorrow. 2145 The aircraft's black box has been located and removed from the scene. It will be taken to Dublin where specialist equipment will be used to download the material in it. 1645 'Diffferent aircraft have different equipment. Cleary no one takes off or tries to land unless they believe it's safe to do so. Our job is to report to the airlines the visual range for the aircraft and then the ultimate decision is for the pilot to operate the aircraft with the airline. 'All we know now is that there were blue skies but heavy fog in different parts of Ireland throughout the morning.' -Brian Ambrose, Chief Executive, Belfast City Airport. 1609 'A family and friends reception centre' is in operation at Belfast City Airport. It is being run by the PNSI and the Belfast Trust Emergency Response Team. 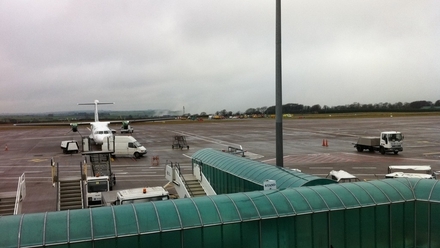 1601 The air accident investigation team from Manx Air has just arrived at Cork Airport. Members arrived by plane just before 4pm and they will be conducting their own investigation into this morning's tragedy. 1533 Presbyterian Moderator Dr Norman Hamilton has expressed his shock and sympathy following this morning's air crash in Cork. ‘I was shocked and saddened to hear of this morning's air accident in Cork and would express my sorrow and sympathy to the families and friends of all those who have died,’ Dr Hamilton said. ‘My prayers and those of the whole Presbyterian Community are with them at this tragic time. 1532 Taoiseach Brian Cowen has arrived in Cork city. 1453 Four of the six survivors of this morning's plan crash remain in a serious condition at Cork University Hospital - two are said to be comfortable. Dr Gerry McCarthy, who heads up the hospital's Trauma One Emergency Department, said that while the four's injuries are serious, they are not life-threatening. They include fractures and a punctured lung. All four remain under observation in the hospital's resuscitation room. The five men and one woman are understood to be in their 40s and 50s. Some relatives have arrived at the hospital and have been directed to a Relatives Room - set up by hospital authorities and staffed by grief counsellors and the hospital's chaplain. The bodies of the deceased have been brought to the City Morgue on the grounds of Cork University Hospital and arrived while the press briefing was on. Ambulance Control put the hospital on alert at 10am this morning and it was officially confirmed as an emergency at 10.35am. The hospital's emergency plan kicked into place and all off-duty staff were called to work. A triage station was set up and the hospital prepared for the arrival of up to 15 injured. They had been told that a plane had flipped over on landing and had gone on fire. A medical team headed up by Dr Stephen Cusack was dispatched to the airport preparing to deal with multiple injuries, including burns, but it has been confirmed that no-one suffered burns. The injuries included fractures and a punctured lung as well as multiple tissue injuries. Six survivors were identified and dispatched to the hospital in a fleet of ambulances arriving just before 11am. 1435 Taoiseach Brian Cowen is to travel to Cork to visit both the airport and the hospital. Mr Cowen is expected to be briefed on the situation in both places and to meet some of those involved. He is travelling to Cork by helicopter. 1430 'The Management and Staff of the Irish Aviation Authority (IAA) extend our deepest sympathy to the families of those who were killed or injured in this morning's air crash at Cork Airport. 1427 The Northern Ireland First and Deputy First Ministers, Peter Robinson, and Martin McGuinness have expressed their shock at the air crash in Cork and have extended their condolences and sympathies to the families involved. Peter Robibson said the Northern Executive would do everything it could logistically to assist families who loved ones may have been involved in the tragedy. Martin McGuinness said the crash was a shocking and deeply saddening event. He said that he had flown on the flight before and had contemplated taking the same service from Belfast to Cork later this week. 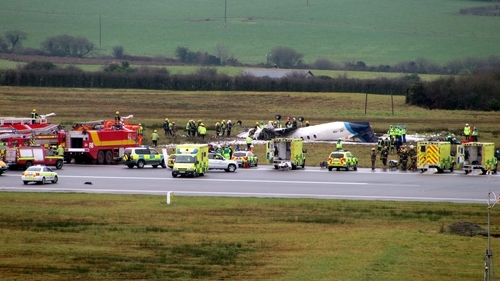 1425 Today's accident is the third time Cork Airport has been linked to an aviation disaster. In March 1968 an Aer Lingus Vickers Viscount took off from Cork bound for London. The aircraft, the St Phelim, later plunged into the sea off the Tuskar Rock lighthouse killing all 57 passengers and 4 crew on board. The cause of the crash has never been determined. In June 1985, an Air India 747 enroute from Canada to London blew up over the Atlantic Ocean as a result of a bomb by Sikh extremists. A total of 329 people died in that incident. Cork Airport served as the search and rescue centre and was also the location where the recovered bodies were brought to. 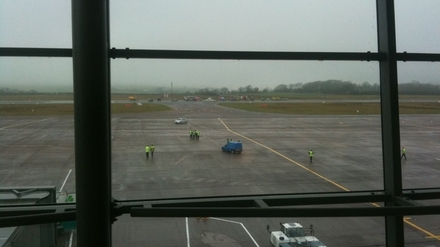 1345 Cork Airport will remain closed for the rest of the day. Chief Superintendent Mick Finn told RTÉ News that further information will be available throughout the day from the Irish Aviation Authority. 1339 Eight fire appliances attended in all - five from Cork City area and three from the Cork County area. About 35 fire crew were involved in the emergency operation. Approximately 35 gardaí were involved at the airport itself. 1330 All bodies have been removed from the airport to Cork University Hospital. All of those on board were adults. Supt Mick Finn told a news conference in Cork that airport fire staff extinguished the fire within three to four minutes. One of the engines caught fire but the fire did not spread to the cockpit. 1326 Head of the Department of Transport Air Accident Investigation Unit Jurgen Whyte said a major priority was the recovery of the flight data recorder and cockpit voice recorder. Asked whether it was standard practice to make three attempts to land, Mr Whyte said it was too early to comment on such issues. Because the plane was registered in Spain, the Spanish authorities have been notified. 1324 Minister for Transport Pat Carey has confirmed that the first Air Accident Investigation Unit has arrived at Cork Airport to investigate this morning's fatal crash. The unit comprises an engineer and a pilot was flown down by helicopter from Baldonnell. A second unit, also comprising an engineer and a pilot, is on the way by road with specialist equipment required for the investigation. The Department has spoken to Conor Murphy of the Northern Ireland Executive and the authorities there were providing assistance to the families. 1322 Two people walked away from this morning's crash reports RTÉ's Damien Tiernan. 1320 'Our first priority must be to help the families of those people who lost their lives and those who are seriously injured,' said a spokesperson from Manx2.com. Manx2.com said it continues to work with the relevant authorities to establish what happened and is also working closely with the emergency services in the aftermath of this tragic incident. 1319 'The Metroliner is quite an old-fashioned aircraft by today's standards, as it's some years since any were produced,' says Aviation Expert David Learmont. 1315 The operator of the flight which crashed in Cork, Flightline BCN, is Barcelona-based. 1311 All Ryanair flights from Cork will operate to/from Shannon Airport until Cork Airport re-opens. All Ryanair passengers to/from Cork should check www.ryanair.com for live flight information. 1301 All Aer Lingus Regional flights - operated by Aer Arann - scheduled to fly from Cork Airport, have been cancelled due to the closure of Cork Airport. 1252 Four of the injured passengers in Cork University Hospital are described as being in a serious condition, while the other two are comfortable. 1246 Manx2.com has expressed its sympathies to the families of those who lost their lives in the accident. The company confirmed that the aircraft was carrying ten passengers and two crew members - a captain and a co-pilot. 1228 An witness at Cork Airport has told RTE News that weather conditions were so poor that the crash could not be seen from the terminal building. Passengers in the terminal were unaware that a crash occured because of the dense fog surrounding the building. 1225 Aer Lingus flights scheduled to land at Cork Airport this morning have been either diverted to Shannon or Cancelled. A number of flights will operate from Shannon airport instead of Cork. 1215 Aviation expert Gerry Byrne said that Cork Airport has 'category 2 instruments' for landing, but he was not sure if the plane would have been capable of landing using those instruments. 1210 Bishop of Cork and Ross John Buckley has sympathised with the families of those killed an injured in the crash. 1200 Chief Executive of the Irish Airport Authority Eamon Brennan has told RTÉ News that services in Cork Airport will be cancelled until at least 6pm this evening. 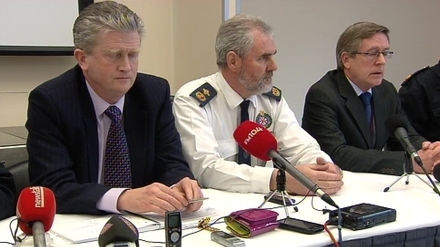 1152 Cork County Council says there will be a joint press conference in the next quarter of an hour with Tom O'Sullivan, Communications Director with CCC and a Garda Superintendent. A spokeswoman has confirmed that 12 people, 10 passengers, 2 crew (one of whom is the pilot) were on board. 1148 The Air Corps is preparing to fly an investigation team from the Department of Transport from Baldonnel to the scene of the crash at Cork airport. Troops are also on standby in Cork to assist at the scene if required. 1145 Representatives of Manx2 are expected to arrive at Belfast City Airport shortly. It is understand a statement will be issued in relation to the incident in Cork. 1140 HSE South has confirmed that six people have been brought to Cork University Hospital by ambulance. They were unable to say at this stage the full extent of their injuries or if they are dead. 1135 The accident is reported to have happened around 9.45am. 1133 The aircraft made three attempts to land at the airport, which was experiencing heavy fog at the time. The second half of the airplane remains turned upside down. 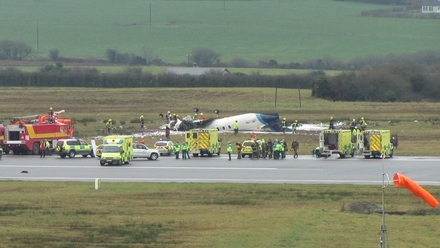 1131 Cork Airport now says three confirmed dead, two seriously injured, two survivors and four unaccounted for. 1109 Debris has been scattered onto the runway and over a wide area. 1108 Fianna Fáil leader Micheál Martin said it's shattering news and he offered sympathy to the families of those affected. Fine Gael leader Enda Kenny has said his prayers and the prayers of the country are with those who had lost their lives. Eamon Gilmore said he was deeply shocked and saddened by the deaths. 1100 A spokesperson for Cork University Hospital has confirmed passengers injured in this morning's crash are being transferred to the hospital. No further information is yet available. 1059 Tom O'Sullivan of Cork County Council told BBC News just before 11 that three people have been confirmed dead after the crash. 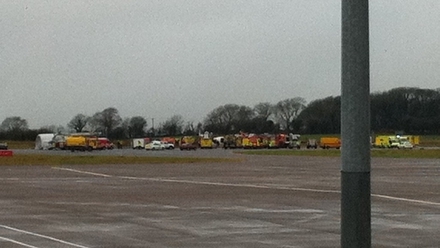 1056 Cork Airport is closed following a plane crash before 10am. All intending passengers should consult with their airline. All buses and traffic is being diverted away from the area. 1045 The Aviation Authority says the aircraft made two attempts to land before crashing. Witnesses report hearing a loud bang. The aircraft is said to have burst into flames. Gardaí, fire crews and ambulances from across the city and county are responding. Gardai are appealing to people to stay away from the airport and for motorists to avoid the area.